The Nobel Prizes were announced last week, and the physics prize went to three scientists for “for theoretical discoveries of topological phase transitions and topological phases of matter.” (I admit that even as a physicist that I have only a vague idea what that actually means, so I’m not going into it.) The Nobels are the premier award for science, but the scientific context in which they were conceived is vastly different than how science is done in the modern world: Alfred Nobel’s will (which sets out the framework for the prizes) was drawn up in 1895, two years before J.J. Thomson discovered the electron. (He got a Nobel for this in 1906.) The science world is fundamentally different today than it was around the turn of the 20th century. This is not to say that the turn of the 20th century was a dull time in science: on the contrary, science was exploding with activity, and whole new fields were opening up. In physics alone, x-rays, radioactivity, the electron, and black body radiation were all discovered within five years (1895-1900). But the model of the scientist at this time was still very much the solitary figure toiling in a lab, perhaps with assistants or a collaborator or two, but not with the highly collaborative lab system that is ubiquitous today. To borrow a phrase from historiography, the traditional model of science is very much a Great Man model, where individual men (and only men, even though there have always been women doing extraordinary scientific work with little to no support or acknowledgement) profoundly shape the scientific era through their work and influence. The Nobels, then, are modelled in this same fashion: no more than three winners can be named, it cannot be awarded to groups or posthumously, and the award must be given for a specific contribution to science. This is no longer a viable framework by which to reward excellence in science. There have been criticisms levelled at the Nobels for decades, and certainly there are many pieces of extraordinary science that have been overlooked for the prize. Women and people of colour have been drastically underrepresented: only two women have won Nobels in physics (Marie Curie in 1903, Maria Goeppert-Mayer in 1963) and about 10% of physics laureates are people (men) of colour, although who is racialized has certainly not been constant throughout the history of the Nobels. No-one from Africa or South America has won the physics Nobel. Lots of people have made these arguments before, and made specific note of people whose work has been overlooked (*cough*VeraRubin*cough*). These are all robust arguments and I feel I have little to add to those: the structure of the Nobels heavily favours Western men in prestigious facilities, and making the Nobels more inclusive requires a lot of work from a lot of levels of the scientific realm. However, even if the prize is awarded to a more diverse group of laureates in coming years, it still operates under the premise that extraordinary science is done by individuals rather than groups, and one look at the author list of any big paper from CERN or TRIUMF should tell you that that’s not the case. Focusing on individuals rather than grounds means that work that is rewarded is somewhat misrepresented. While science in the early 1900’s was growing by the sorts of leaps and bounds that the Nobel was designed to reward, even the groundbreaking work of today is in some senses incremental. There were decades of work put in in understanding gravitational waves computationally, theoretically, and analytically, and all that work was necessary to both build LIGO and be able to intepret data from it. While the discovery of GW150914 was a singular shift in our ability to understand the universe, that discovery was the culmination of a mountain of scientific research and literally thousands of peoples’ contribution. Isolating only the final discovery from the context of preceding work makes no sense, and is a fundamentally inaccurate narrative to write about the scientific process. It also, incidentally, reinforces the traditional model of Scientist as Devoted Monastic Scholar, where science is a calling only accessible to the most brilliant and devoted among us. This is nonsense: insisting that the Proper Way To Do Science a) exists in the singular b) is in isolation and drudgery and c) is imperatively all-consuming is a protocol for burnout. This model is regressive, extremely exclusionary, conducive to bad science and worse mental health, and a terrible yardstick by which to evaluate scientists and their work. As well as failing to recognize the contributions of labs and collaborations, the focus on singular discoveries has lead to whole swaths of physics are un(der)represented in the Nobels. I’ve tallied up the fields listed with each Nobel physics laureate, and plotted the data below. For each prize awarded, multiple categories listed are considered individually, but if two or three scientists split the prize for the same work, each category is counted only once. 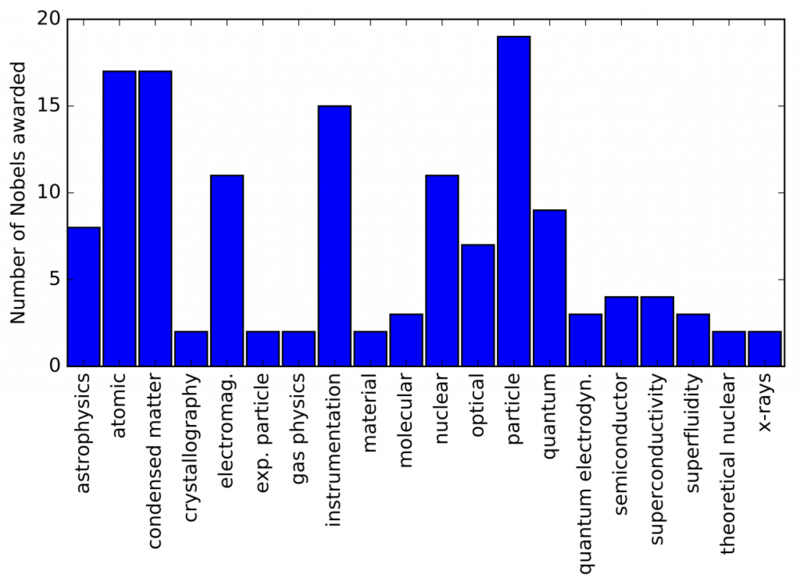 Categories that were used to describe only one Nobel are applied electromagnetism, applied mechanics, applied optical physics, cosmic radiation, cosmology, critical phenomena, electron optics, electronics technology, fiber technology, interferometry, mechanics, metals, neutrino astrophysics, plasma physics, quantum optics, space physics, and theoretical physics; none of these are included in the plot for brevity. Number of Nobels awarded for each subfield of physics. Categories with only one Nobel listed are not included for brevity. I’m surprised that there is so few awards given for work in the astrophysics / cosmological / gravitational physics, ie, work concerning the huge scales of the universe. Instead, the significant majority of the Nobels have been given for discoveries at the atomic level or smaller. The defining frameworks for the study of the universe at the largest scales (general relativity) and smallest scales (quantum mechanics) have been developed since the Nobels have been awarded, so both areas of physics have been rich with discoveries and breakthroughs throughout the past hundred years. There’s also a dearth of Nobels given for research that falls in the range of scales where classical mechanics are sufficient: aside from a few prizes awarded for superfluidity, there have been no Nobels awarded for fluid mechanics. There’s nothing relating to environmental, planetary, geological, solar, or atmospheric physics, and nothing that can be considered interdisciplinary beyond the overlap with chemistry. Applied physics is almost entirely ignored, and the prizes listed as being experimental physics are largely also categorized as atomic or particle physics. Here’s my theory about why this is the case: the Nobels are set up to reward single, defining discoveries, and the nature of small scale physics (especially particle physics) meshes better with that focus than many other fields. It’s straightforward to point to “we discovered a new particle” as a groundbreaking discovery, but it’s a little fuzzier to say “we figured out how to measure cosmological distances” and fuzzier yet to say “we understand the structure and circulation of the atmosphere.” There is a lot of work that leads to the discovery of a new particle, certainly, but one day there was no J/psi meson and then the next day there was. But describing the structure of the atmosphere was (and is) done in incremental pieces: there’s no clear single instance in time when the discovery happened. Understanding the structure of the atmosphere is extremely important, but it is difficult to point to a single prominent discovery or development that stands above the rest of the body of work. Ultimately, I think this is why we should overhaul the Nobels: clearcut discoveries typically involve hundreds or thousands of people, and individual people typically push the frontier of science by increments rather than by revolution. I have no knowledge whatsoever of Swedish law, and so I have no idea how legally entrenched the award criteria are; obviously it’s not nothing to overhaul a prominent international award rooted in a legal will. It’s quite possible that there is no legal way to adjust the number of possible laureates, and it’s quite possible that there is no legal way to permanently cease awarding the prize. But I think it’s time that those options are considered in depth by the Nobel Foundation, because the model of the Nobels is fundamentally incompatible with how scientific progress is made today. The most prestigious prize in science should reflect the collaboration and continuous progress woven into the ecology of the modern scientific world, and it should reflect the diversity of both scientists and scientific endeavours undertaken. I am unconvinced that a single prize for all of physics makes much sense anymore, and there are critically important areas of physics that deserve recognition as well as the traditional fields. I believe that the prestige of the Nobels can be maintained while expanding the number of prizes awarded and increasing the diversity of work considered for recognition. Science is becoming more inclusive and collaborative, and though there is substantial work to be done at all levels of the scientific community, modernizing the Nobels is one way for the highest echelons of the scientific community to lead the way.